All your favourite sites are one click away. Login to Your Emails Faster! With LastLogin you can access all your emails account, regardless of the provider. We provide you with a complete package to manage your email accounts. We provide a faster way to search inside your email box, no matter the email provider. 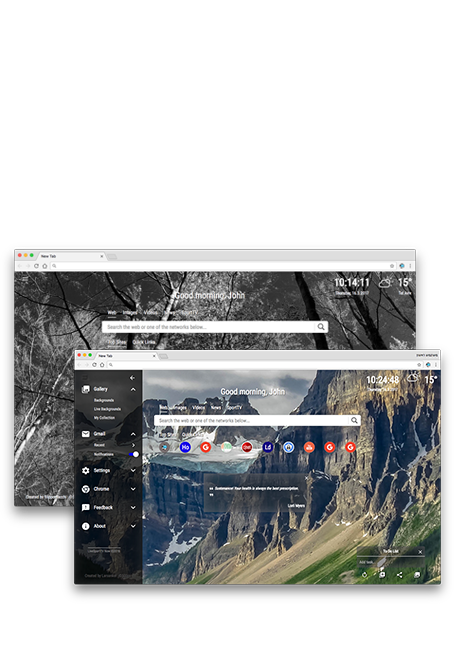 Design your new-tab according to your own taste: backgrounds, search provider,to-do list,quote of the day, etc. You can customize your new-tab according to your taste. Our new-tab extension will automatically save your most visted sites, giving you easy access by 1 click. Choose your new live background from a variety of amazing designs. Get a diffrent background each day you open your browser. Wouldn't it be nice to access your email quicker? Stop killing your productivity and access your email in just one click. Save a lot of time by easily accessing your email from your new LastLogin new tab page!